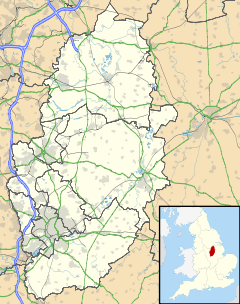 Carlton is a suburb to the east of the city of Nottingham, Nottinghamshire, England. It is in the borough of Gedling. The population of the Gedling ward at the 2011 Census was 6,881. In the Domesday Book of 1086, Carlton is referred to as Carentune. Like other parts of Nottingham, Carlton grew up with the textile industry in the 19th century. It is now mostly residential. Until 1950, Carlton was part of the Rushcliffe parliamentary constituency. It had its own eponymous constituency from 1950 until 1983, since when it has been in the Gedling constituency. In 1974 Carlton Urban District became part of the newly formed Borough of Gedling. It is close to Bakersfield, Colwick, Gedling, Mapperley, Netherfield, Sneinton and St Ann's. It is near the River Trent and has an NG4 post code. The main shopping street is Carlton Hill, which has several shopping chains and smaller shops such as newsagents, chemists, and grocers. Carlton Square, the traditional centre of Carlton is today a shopping centre. There are numerous areas of grass for children to play on, as the roads tend to be quite busy. Carlton has two leisure centres: Richard Herrod Centre (an indoor bowling centre) on Foxhill Road and Carlton Forum (a swimming pool, gym and all-weather pitches) on Coningswath Road, off Cavendish Road. Carlton Laundry on Primrose Road is a Grade II listed building by Watson Fothergill. It was built in 1899 as a laundry and dye works. Carlton railway station is on the Nottingham to Lincoln Line. N73: Mapperley, Westdale Lane, Carlton Valley, Netherfield, Victoria Park. L74: Victoria Park, Netherfield, Cavendish Road, Gedling. Local schools are Parkdale School, Carlton le Willows Academy, Sherwood Academy and The Carlton Academy. Carlton Central Primary School was founded in the late 19th century but after a piece of masonry fell one night from the roof into the school assembly area in the 1960s, the school was demolished and the council house and the current Carlton Square were built in its place. A new school had been built on Foxhill Road/Carlton Hill and Carlton Central Primary School was relocated there. The new school had originally been intended to replace the deteriorating St. Paul's School on Carlton Hill. St Paul’s was closed in 1983 after many years and attempts to find a new site and financing for a new building were unsuccessful. Carlton Central Primary School is not the only primary school in Carlton. Amongst others, Porchester Junior School (which has recently been extended) is situated at the top of Standhill Road. Carlton has a number of pre schools & nurseries including Foxy Creeks Pre School (based in the Richard Herrod Centre, Foxhill Road) and Good Foundations Day nursery on Station Road. Carlton is home to the Midlands Academy of Dance and Drama (also known as MADD). It is one of the UK’s top musical theatre colleges. St. Paul's Church, Carlton-in-the-Willows was built by Henry Herbert, 4th Earl of Carnarvon and consecrated in 1885. Located at the bottom of Carlton Hill, off Church Street, it is built in the style of a Roman Basilica and resides in the diocese of Southwell and Nottingham. See www.stpaulscarlton.org for more details Carlton Pentecostal Church is located opposite the fire station on Station Road. Carlton Town Football Club were champions of Northern Counties East Football League Division One in the 2005-2006 season. Carlton Forum is a large leisure centre on Coningswath Road. Richard Beckinsale, actor and father of actresses Samantha Beckinsale and Kate Beckinsale, was born in Carlton in 1947. ^ "Gedling ward population 2011". Neighbourhood Statistics. Office for National Statistics. Retrieved 6 April 2016. ^ "Carlton Laundry, Carlton". BritishListedBuildings.co.uk. Retrieved 2014-03-20. ^ "MADD - Midlands Academy of Dance & Drama". Maddcollege.co.uk. Retrieved 4 October 2014. This page was last edited on 6 February 2019, at 12:44 (UTC).